Pick your favorite: go bar hopping in the Red Light District or go crawling from bar to club in the Leidseplein area with your mates. 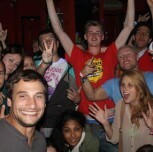 These are the biggest and best Party Pub Crawls in Amsterdam! We will take you to the best bars, pubs and a club in Amsterdam's 'warmest' neighborhood. A free Jägermeister, Vodka, Sambuca or Apple Sour shot at every venue will surely help to keep you warm. But the numerous drinking games to play in our party spots will keep you up and running all night anyway. When joining us on the Leidseplein Party Pub Crawl you get one free shot in all the hotspots we take you to in this bustling hood. Plus 30 minutes of unlimited vodka shots to start properly. The price also includes entrance to all six venues to serve you one of the best nights of your life. One of Europe's largest pub crawls offers more than just free booze and entrance. We show you Amsterdam's finest and although groups are normally not allowed to get in, your entrance to all the selected bars is 100% guaranteed with this choice! Both these ultimate experiences of the best places of Amsterdam cost € 22,50 per person (including all taxes). If you are with a group of 12 or more, you can have your private crawl with just you and your lads. The price is € 27,50 per person. Please let us know if you prefer a private party pub crawl or if you prefer the one with other groups as well! 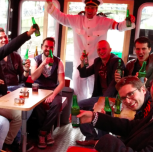 Feel free to contact us when you have any questions or get a quote when you are interested in our Party Pub Crawl in Amsterdam. You see, I travel to little so many things I don't know. God or who ever is responsible for your kindness should bless you and your patient for your clients. I'm looking forward to our visit in Amsterdam and the pub crawl.